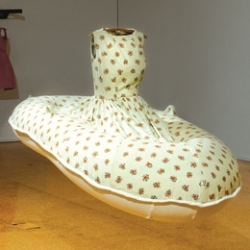 I'm absolutely in love with Jacqueline Bradley's Boat Dress, part of her exhibition The Outdoors Type, on now at Craft Victoria. The show comprises just five works (spoiler alert: I'm going to tell you about all of them), coming together in a surrealist blend of elegant design and childlike joy. The show is dominated by two meticulously tailored whimsical costumes: Boat Dress, an inflatable boat turned summer frock, and Kite Jacket, a bright orange couture jacket that turns the wearer into a giant child's kite. All the details are considered, from matching orange bows on the oversized kite string to the tailored boat handles and air valve. Both works are wearable, and the viewer is invited to join in the fun by interacting with a tin boxed mutoscope (a kind of hand-cranked rotary flip-book) accompanying each outfit, showing a costumed figure frolicking in the outdoors. The final work, Snake in the Long Grass Shoes, merges a pair of high heels in fabric matching the Boat Dress with metre-high ladder-stilts, embodying Jacqueline's intention to "make a space for the uncomfortable and unskilled when faced with the great outdoors." I only wished the exhibition space was big enough to accommodate more of these fantastical pieces - but a larger version of the exhibition was shown at the Canberra Contemporary Art Space last year, and additional outdoorsy works can be seen on Jacqueline's website. The Outdoors Type runs until 9 June.